Wisteria is an incredibly vigorous climber and in the wild it engulfs trees, a bit like our native Ivy (Hedera helix). Its main goal in life is to reach the top of the tree canopy so it can absorb as much light as possible. For this reason, it grows an enormous amount in one season, this can be sometimes be as much as 20 – 30ft. To encourage your Wisteria to flower, it must be pruned twice a year. The first prune in August is the most vital, this is where the removal of the extensive growth is carried out. You want to prune the wispy growth down to 6 to 8 buds from the plants framework. This will then encourage the plant to produce flower buds, instead of putting its energy into growing as big as possible. Then, in March, you reduce the growth that you pruned earlier to three buds. This is carried out to increase the size of the blooms, with a Wisteria you want quality, not quantity. The reason you do not prune straight down to three buds in August is because you wouldn’t want to lose all your buds in winter. Wisteria must be grown in full sun, in a fertile soil which is well drained, but does not dry out too quickly. They make excellent plants to train over a pergola or grown against a wall. 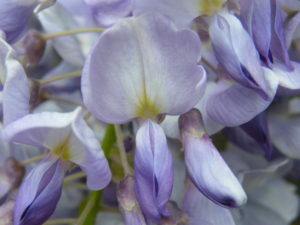 There are three species that are commonly grown in gardens and one interesting fact is that the Chinese Wisteria (Wisteria sinensis) twines anticlockwise, while the Japanese Wisteria (Wisteria floribunda) twines clockwise.